All Saints Catholic College is pleased to announce that students will be receiving the best ever GCSE results achieved at the school in recent years. This follows on from our recent ‘Good’ grading from Ofsted in July 2018. There has been a significant increase in the proportion of students gaining a pass in both English and Maths. 75% of students gained a pass in English, with 64% gaining a pass in Maths. This is a significant increase of over 30% from previous years and shows the impact of the immense hard work from pupils and staff in transforming our school. Even more impressive is that Biology achieved 91% at grade 4 and above. Chemistry and Physics also performed well having both gained 87% at grade 4 and above. Notable successes include Spanish, Food and Cookery, which both achieved an incredible 94% at grade 4 and above. Chiara Morreale – Made 2.5 grades more than expected across all subjects. Jake Marklew – Made 2 grades more than expected across all subjects. Upton Hall School FCJ pupils were in celebratory mood as they shared their wonderful GCSE exam results with friends, family and staff. Kate, Erin and Ffion were awarded GCSE top grades of 9 across all of their subjects. They also attained a grade A* in Additional Mathematics – a fantastic achievement! Seven pupils Lydia, Faith, Eva, Katie, Hannah, Catherine and Jess were awarded grades 8 or 9 in all of their subjects, a deserved reward for all of their hard work throughout their GCSE courses. Many subject areas were also celebrating outstanding success. More than a quarter of all students who took a GCSE in Religious Studies, Music and Sports Studies were awarded a top grade 9. More than a third of students in the science subjects, History, Geography and English Literature attained a grade 8 or 9. Headmistress, Mrs Gaunt said, ‘There has been a great atmosphere in school this morning, it has been a real celebration. We are delighted to share in the success of our Year 11 pupils. They worked hard, and their determination and talent has produced the results that they deserve. We are looking forward to them joining the sixth form next week as they start their A level courses’. The College is exceptionally pleased with the performance of our students this year who have once again achieved an excellent set of results despite significant changes at GCSE to the new 9-1 grades. In English, 77% of students have achieved grade 4 and above, and in Mathematics 66% have achieved grade 4 and above, this gives us a combined figure of 60% of our students achieving grade 4 and above in English and Maths. “We are delighted with the achievements of all our Year 11 students who have worked hard and achieved excellent results. St Thomas More Catholic High School are over the moon with the success of their pupils in the GCSE examinations the year. For the last two years the Crewe school has been at the top of the DfE league tables in Cheshire East for the best overall performance and the pupils yet again this year have made outstanding progress. The Head, Mrs Hogg, wanted all the pupils to know how proud the school were of their achievements not only the academic successes but the progress they have made in all areas of school life. The year group have been involved in many extra curriculum activities and have developed socially, morally, spiritually and culturally over the last five years making a positive contribution not only to the school but also to the local community with their fund raising and parish involvement. Some of the pupils have had much to cope with this year, including serious illness, long periods in hospital and bereavement, and yet they have managed to still shine and can now happily continue with their studies post 16 thanks to their bravery, dedication, and the help of their friends, families and dedicated staff. The school is especially pleased with the very high percentage of grade 9’s and 8’s the pupils achieved. In this group included three pupils who attended the Shrewsbury Diocese Lourdes Pilgrimage this summer giving up their holiday to care for the sick, housebound and lonely. The school motto from St Catherine is that if you are what God has called you to be you will set the world on fire. STM are very confident that all our Year 11 pupils will now do this! 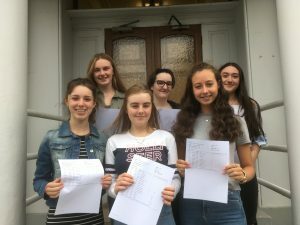 Despite the most gruelling GCSE examination season ever, students at The Catholic High School have come out on top and are proudly taking their results home. Standards in English and Maths are even higher than last year, when these two subjects were the first to adopt the new ‘9-1’ grades. 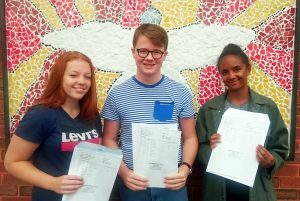 The top achievers this year are Mac Alexander, with eight ‘7-9’ grades (the equivalent of eight A or A* grades under the old system), including a ‘9’ in his Physics GCSE; Emma Bissell who has six ‘9’ grades along with two 8s and a 7; Matthew Brayne (eight ‘7-9’ grades); Sarah Dodd (four 9s and four 8s); Anastasia Doran (four 9s and five 8s); Nadim Haque (four 8s and four 7s); Elie Jones (five 8s and two 7s); Alice Nixon (four 9s, three 8s and two 7s); Thomas Preece (one 9, two 8s and three 7s); Sophie Tobin (one 9, one 8 and four 7s). Talented linguist Jenni Allman was rewarded with a 9 grade in Spanish and an 8 in French. The hard work and dedication of students and staff at All Hallows’ Catholic College in the face of the reformed GCSE examinations have paid off. All Hallows’ students have achieved outstanding results in the class of 2018; 82% of students achieved five or more GCSE standard passes including English and Mathematics (grades 9-4), and students of all abilities have made good progress, given their starting points. 90% of students achieved a grade 4 or above in English and 82% in Mathematics. Student performance at the highest grades was excellent, with 37 students achieving the coveted grade 9 in at least one of their examinations, whilst 13.7% of all grades were at either a grade 8 or 9. The highest performing student was Louis Hill, who achieved grade 9 in all 10 of his examinations. Six students achieved 5 or more grade 9s in total; Aidan Arch, Jack Croker, Rosa Hart, Louis Hill, Alexander Insley and Tommaso Palo. Louis Hill said, ‘I’m really surprised as I hadn’t expected to do so well’. The achievements in our vocational subjects has been excellent and this year also saw three students taking the Higher Project Qualification as part of a programme for higher ability students: Aidan Arch, Alexander Insley and Conor Maguinness. Acting Principal, Peter Nickson said, ‘These results are a testament to the hard work and dedication of both staff and pupils. They reflect the quality of teaching and learning at All Hallows, which has been one of the pillars of the success of the College for many years. Most importantly, individual students will now have opportunities in life opened up, as a result of strong GCSE and BTEC results. As well as values, this is one of the core aims of education, one which we work very hard at, and is a journey which we feel very honoured to have shared with the students and their parents and carers’. Chair of Governors, Jacqui Feely said, ‘We are very proud and grateful for the hard work of students and staff, which have led to these wonderful results. Thank you to everyone for their dedication and devotion to the academic success and welfare of our young people’. Well done to the Class of 2018 at Harrytown Catholic High School on their amazing GCSE results. An impressive 68% of students achieved a Grade 4 or above in both English & Maths, which is the equivalent to the old Grade C, and 25 students achieved the new top Grade 9 in at least one of their subjects. In addition, one of our students attained 7 Grade 9s overall, whilst another achieved 3 Grade 9s in Maths, English Language and English Literature amongst his 6 Grade 9s overall. Year 11students at St. Anselm’s College, Birkenhead, are celebrating their GCSE results today following some outstanding individual achievements in the first year of reformed GCSE results across the curriculum. 93% of Year 11 boys achieved grades 4 or above in both English and Maths, with 27% gaining grades 7-9 in both subjects, and 38% of all GCSE results were at the top grades. The Attainment 8 score of 60.56 was the best of the past 3 years since this national measure was introduced. This maintained the high standards of recent years and follows on from excellent A Level results last week. There were some outstanding individual results with many boys achieving the new grade 9. Pride of place goes to James Chindripu from Heswall. His 10 grade 9s are the best results ever achieved at the College and put him in the top 1% of students nationally! Kapilash Kugabalan, from Wallasey, achieved 7 grade 9s and Robert Meadows from Prenton secured 6 grade 9s. 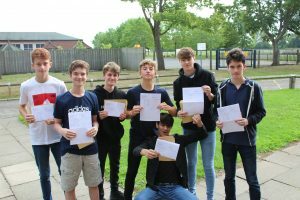 Gabriel Ferrante, Joseph Joinson, Sean Lynch, Harvey Murphy, Abhishiek Sansom, George Shannon, Bradley Smythe, Alex St. John and Sam Tillotson-Schroder all achieved 8+ grades 8-9. Following on from successful A Level outcomes last week, we are delighted to report that students at St Chad’s have achieved some of the highest grades possible in the new 1-9 grading system as well as students making significant progress during their time at the school. Congratulations to students, parents, staff and governors who have all worked hard to achieve these positive outcomes. We are very proud of all of our students and wish them every success in the future. The Attainment 8 ratio, the government’s benchmark denoting the average of all grades increased from 68.8 to just shy of 70, with the key Progress 8 score, denoting just how much the boys have achieved than was predicted at age 11 “likely to be higher yet again although this won’t be known for a number of weeks” said Mr Rainey. 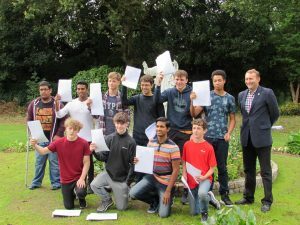 Pictured from left to right are some of the high flyers: Trafford swimmer Matthew Morys-Edge, 16, got four 9s, six 8s and an A in Further Maths and ultimately wants to read Law; Samuel Scapens, 16, got five 9s, three 8s, one 7 and A* with Distinction in Further Maths and wants to study Engineering; Mathematics national gold medallist Niall Devlin, 16, got seven 9s, an 8 and a 6 with an A* and an A* with distinction and is considering either Engineering or Economics; expert ornithologist Thomas Diffley, 16, got six 9s, three 8s one 7 and an A and wants to be a surgeon; Conor Healy, 16, got seven 9is, two 8s and one 7 and wants to read Medicine; Rory Williams, 16, got a stunning nine 9s and two A*s among only 732 students nationwide to record a clean sweep of top grades; brilliant Abhishek Alex also got the full nine 9s with A8 and an A* with Distinction and wants ultimately to read Medicine; Sal Sharks academy rugby player Conor Quah, got four 9s, five 8s a 7 and an A grade; high flyer Eamonn Gilmore, 16 got ten 9s and an A* with distinction and is another hoping to read Medicine; Youth Parliament politician Matthew Doyle, 16, got seven 9s. three 8s and an A* with distinction; martial arts expert and musician Samuel Lopes, 16, got nine 9s, one 8 and an A* while water polo player John Bolton got five 9s, four 8s and on 7 and is considering Engineering or Medicine. We are delighted to announce that the Class of 2018 at St James’ Catholic High School have achieved outstanding GCSE results, once again. An impressive 70% of students attained a Grade 4 or above in both English & Maths (the equivalent to the old Grade C), and an impressive 31 students attained the new top grade 9 in at least one of their subjects. 26% of all students achieved 5 or more GCSEs at Grade 7 or above (the equivalent to the old Grades A / A*), and 37% achieved 3 or more GCSEs at Grade 7 or above. Head Boy Ryand Yandoc, who achieved seven GCSEs at Grade 9 said, “This is amazing. All of the hard work has paid off. I would like to thank the staff who have been so supportive. Without them, this wouldn’t have been possible”. 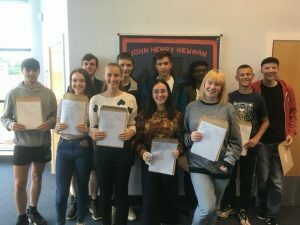 Cardinal Newman Catholic High School are delighted with the commitment and application their students demonstrated in tackling the rigorous GCSEs this year; achieving a set of very pleasing results in August. An impressive 72% achieved grades 9-4 in English Maths with 81% of students achieving grade 4 or above in English Language and 77% achieving grade 4 in Maths. The number of students achieving the Ebacc measure was one of the best in the local area; 43% of students achieved this prestigious measure, ensuring that students are well prepared for study post-16 and beyond. The hard work of staff and students has also resulted in some outstanding outcomes in individual subject areas. Despite a fall in the pass rate nationally, 74% of students achieved grade 4 or above in RE. Additional stand-out successes included 100% in Biology, Chemistry, Art and Design and Health and Social Care and 92% in German. We are also delighted with the outcomes for individual students with a number of students achieving 9 or more passes at grades 7-9 and 50% of pupils achieving at least one grade 7-9.